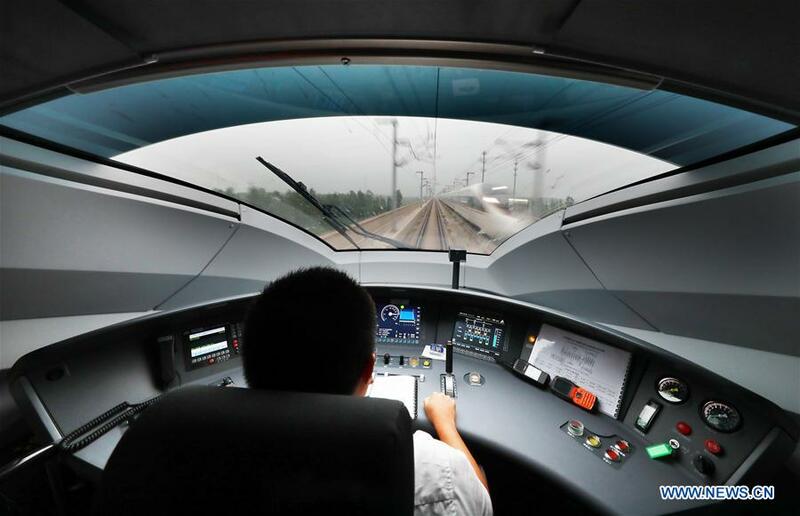 BEIJING/TIANJIN, Aug. 8 (Xinhua) -- China on Wednesday increased the maximum speed of the bullet trains on the Beijing-Tianjin high-speed railway from 300 km per hour (kph) to 350 kph. The Fuxing (Rejuvenation) trains, the newest bullet train model developed in China, first ran at 350 kph on the Beijing-Shanghai high-speed railway, with the Beijing-Tianjin line the second to receive the upgrade. The increase will shorten travel time between Beijing South Railway Station and Tianjin Railway Station from 35 minutes to 30 minutes with no price difference in fares. The C2581 train departs from Beijing at 6:02 a.m.
348, 349...When the display finally showed the train speed gradually reach 350 kph, the train coach erupted in applause. Many passengers took pictures of the display with their cell phones or cameras. The Fuxing trains are a substantial upgrade of the previous CRH bullet trains, said Pan Yu, an assistant engineer from the China Railway Beijing Group (CRBG). Fuxing trains are taller and more spacious, and can run in an environment between minus 40 degrees Celsius and 40 degrees Celsius, he said. The streamline design has reduced resistance by 7.5 percent to 12.3 percent, which reduces energy consumption to a large extent, according to Pan. The Beijing-Tianjin high-speed railway was China's first high-speed railway line which went into operation in 2008. Over the past ten years, 250 million passengers have been carried on the line. The line issued a new train schedule Wednesday, with the daily train frequency increasing from 217 one-way services to 272, according to the CRBG. "We have waited a long time for this moment," said Wu Jiaxu, a postgraduate student train fan who headed here from the city of Baoding, Hebei Province. Wu, 25, said he would save money from his part-time job to travel on high-speed trains. Wu has joined a train fan club via the social networking app WeChat, and more than ten club members scrambled for the tickets and boarded the C2581 train. The length of high-speed railway lines in China increased to 25,000 km in 2017, accounting for 66 percent of the world's total. By 2020, the country's high-speed rail length is expected to reach 30,000 km, covering 80 percent of major cities. A network of eight east-west high-speed railway lines and eight north-south lines will be built, according to a railway development plan. David Feng, a Swiss train fan who teaches at a Beijing university, took the first Beijing-Tianjin high-speed train on Aug. 1, 2008. Since then, Feng has taken numerous trains in China and posted what he saw and thought on websites. He has visited over 2,300 Chinese railway stations out of the more than 3,000 spread across the country. "I have witnessed the great change of China's high-speed railway network over the past ten years. I can't wait to see what the railway will look like in another ten years," he said.